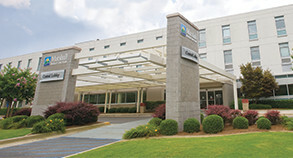 Marshall Medical offers major advances in minimally-invasive procedures. With 55" monitors and greater visual clarity, 4K technology is big news for local patients. 4K laparoscopy video technology represents the latest generation of high definition or HD technology. It is now being used in all operating rooms at Marshall Medical North and South. Marshall Medical was actually the first installation in the U.S. of the Olympus/Sony system, which is the only integrated 4K surgical system of its kind. "The picture is much brighter and gives a clear image of even small vessels," said Tim Bean, director of surgery for Marshall Medical Centers. "The equipment also has a green light feature which helps to identify cancer cells in the bladder and uterus." 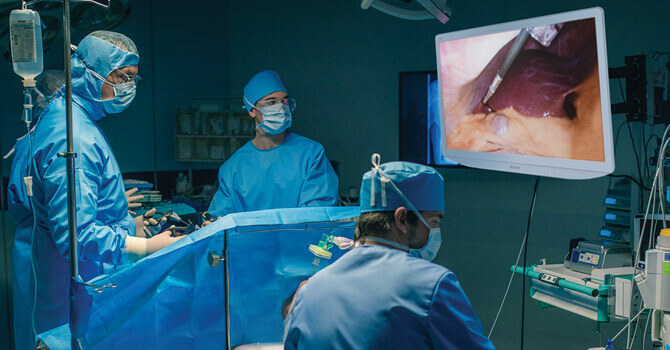 The Olympus 4K Ultra High-Definition 55-inch video system changes the way surgeons operate, offering the same immersive experience in the operating room as people experience in their living rooms. Surgeons are not limited by resolution or image quality, only by the limits of the human eye. Precise visualization enables the diagnosis and treatment of disease. 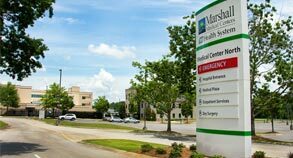 At Marshall Medical, 4K Laparoscopy is being used in general surgery, as well as gynecological, orthopedic, urology and ear, nose and throat procedures. For information on our surgeons or specific surgery types, please visit Physicians By Specialty and Specialty Descriptions under Find A Physician.